Last year I addressed the Untied Nations on the need for a Universal Declaration of Planetary Rights. One year on and Bolivia is now going to run with this idea. This week I am in Copenhagen for the Climate negotiations, but they look set to collapse. 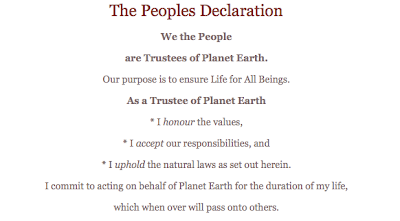 So, today I am launching a Planet Earth Trust for us the people to sign up to. Help me, with many millions of others, find the solution for life of all beings. The planet is our capital asset and we the people have a responsibility to ensure that this asset is protected, not exploited. We can do that by being trustees for the planet. 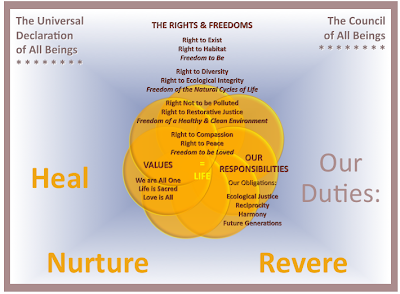 When humanity becomes the trustee of the planet and holds the asset in perpetuity for use of all beings, as guided by the principles, life is assured for us all.